Hawaii senior Juliana Sanders hit through a Santa Clara block during the Rainbow Wahine's hard-fought victory over the Broncos at the Stan Sheriff Center last night. It was about more than winning a title. It was a search to find a viable lineup, an identity that could be flexible without folding. The journey isn't over, but it has a positive start. For the first time in three tournaments this season, No. 16 Hawaii picked up the championship trophy. The Rainbow Wahine also picked up a boost of confidence heading into next week's Western Athletic Conference opener. Jamie Houston put down a match-high 26 kills in earning Most Outstanding Player honors as Hawaii won the Waikiki Beach Marriott Challenge last night by defeating No. 19 Santa Clara 28-30, 30-20, 30-28, 30-27. Aneli Cubi-Otineru added 16 kills and 15 digs, and Amber Kaufman had 10 kills in front of 4,619 (6,272 tickets) at the Stan Sheriff Center. "I think we learned that when we pass and play together we can be a top team," Houston said. "I think we've learned to play more as a team." "Tonight, there was no second-guessing," said setter Stephanie Brandt, finishing with 15 digs and 61 assists. "Before this tournament, we said that this was where it comes together. Right here, right now." Tara Hittle watched her block drop over the net last night. Hawaii (6-3) outblocked Santa Clara (6-3) 14-10, with Juliana Sanders in on seven and Amber Kaufman five. 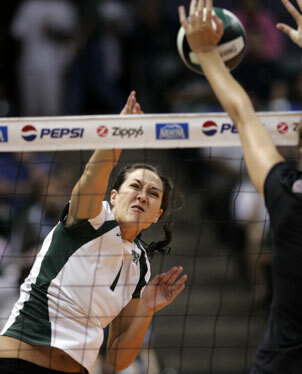 The Wahine had five players in double-digit digs, led by Elizabeth Ka'aihue's 20. Brittany Lowe led the Broncos with 20 kills. Nina Sevastopoulos added 15 and Lindsy Evans 14. In the opener, Wichita State (6-3) claimed second place with a 30-21, 30-18, 30-20 sweep of Eastern Washington (1-8). The Wahine pointed to the five-set victory over Wichita State on Friday as a key to last night's victory. "It gave us courage to believe in ourselves," Cubi-Otineru said. "We know each other better now, have more faith in each other." Wahine coach Dave Shoji said he had faith his team would put it together eventually. "We needed time to settle in," he said. "We've grown tremendously in the past three weeks. "After Oregon State (a loss on Aug. 26), I wasn't sure what are record would be at this point. We've seen nine teams, seven or eight which should make the (NCAA) tournament and we've got five quality wins. We have to continue to practice hard and get better." The Shockers rebounded nicely after Friday's disappointing loss to the Wahine with a sweep of the Eagles in 80 minutes. Emily Stockman had 12 kills and Stephanie Tokarz 11 for WSU. The only disappointment was that libero Kelly Broussard didn't have enough time to break the tournament record for digs (77); she had 18 yesterday to finish with 69. The All-Tournament team was Hayley Hills, Eastern Washington; Kelly Broussard and Emily Stockman, Wichita State; Crystal Matich, Santa Clara; Aneli Cubi-Otineru and Elizabeth Ka'aihue, Hawaii. MOP: Jamie Houston, Hawaii. Key - g: games; k: kills; e: hitting errors; att: attempts; pct. : hitting percentage; bs: block solos; ba: block assists; d: digs. Aces - SCU (5): Lowe 2, Walters 2, Evans. Hawaii (3): Kaufman 2, Cubi-Otineru. Assists - SCU (63): Matich 52, Lowe 7, Walters 2, Sevastopoulos, O'Brien. Hawaii (65): Brandt 61, Kaaihue 3, Cubi-Otineru. T - 2:30. Officials -Dickson Chun, Ernest Ho. A - 4,619.